The World War II battle for the Breskens Pocket, code named Operation Switchback, was the crucial first stage in the struggle to open the Port of Antwerp in Belgium. It began at dawn on Oct. 6, 1944, when 7th Canadian Infantry Brigade crossed the Leopold Canal in northern Belgium not far from the Dutch border. This frontal assault was intended to divert the enemy’s attention away from the unprotected north coast of the Breskens Pocket where Brigadier John Rockingham’s 9th Cdn. Inf. Bde. was planning an amphibious landing. Rockingham’s Highland Bde. was to mount its attack in tracked landing vehicles–known as Buffaloes–within 36 hours of crossing the Leopold Canal. However, Murphy’s Law was the rule in 1944 and nearly everything started to go wrong. The Buffaloes proved difficult to steer at the slow speeds necessary to traverse the Terneuzen Canal east of the Dutch town of Terneuzen. The canal’s locks were also difficult to negotiate. A final set of locks was damaged and the engineers had to cut ramps in the canal bank to bypass the obstacle. By then it was too late to launch the operation on the night of Oct. 7-8. Oct. 8 was a day of considerable tension. The delay had exposed 7th Bde. to an extra 24 hours of misery. There was also the understandable fear that the security of the amphibious assault would be compromised. Fortunately, the local Dutch resistance had rounded up known collaborators and so the enemy remained blissfully ignorant of the threat to its rear. Unfortunately, the river pilots promised by the same resistance failed to appear and a desperate search for someone to navigate the flotilla began. The naval liaison officer at army headquarters, Lieutenant-Commander R.D. Franks, volunteered to take the soldiers to sea and shortly before midnight on Oct. 8, the first Buffaloes “waddled down the ramp and splashed into the water.” The promised artillery barrage began effectively blanketing the noise of the aircraft engines that powered the Buffaloes. Franks located the points separating the two landing beaches and then used a flickering signal lamp to guide the assault troops to their proper sector. The Buffaloes roared towards the shore and churned through the mud flats. At Amber beach, a number of the vehicles bogged down, but at Green beach the North Novas landed on dry land. They overran a German outpost, capturing nine men who had apparently slept through the familiar sounds of artillery and aircraft engines. The North Novas quickly expanded their beachhead, but the Highland Light Inf. came under machine-gun fire while it was still sorting out the confusion of landing in a quagmire. The HLI landing area was less than two kilometres from the Dutch village of Biervliet, headquarters of the battalion that had been posted by German Major-General Knut Eberding to defend the Braakman Inlet. The inlet, which is connected to a larger body of water known as the West Scheldt, is situated roughly three kilometres east of Biervliet. 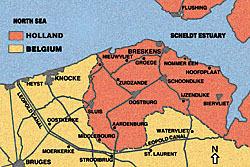 The enemy was beaten back, but no advance to Biervliet or Hoofdplaat–located roughly five kilometres to the north–was possible until the rest of the brigade arrived. While the assault troops carved out a beachhead, the flotilla returned to Terneuzen to lift the reserve battalion, the Stormont, Dundas and Glengarry Highlanders and the machine-gun and mortar platoons of the Camerons of Ottawa. The second trip at 9 a.m. was skillfully screened through the efforts of 806 Royal Pioneer Smoke Company, a British unit under Canadian command. Major Temp Hugill of First Cdn. Army’s chemical warfare staff decided to use stormboats and amphibious trucks “to drop off a smoke float every 400 yards along a dogleg line running northwest from Terneuzen for 8,000 yards.” Since the smoke floats lasted only 15 minutes, a complex renewal organization had to be improvised. Eventually rafts were built and anchored in the Scheldt estuary to maintain the screen. Rockingham reached the narrow beachhead with the second wave and immediately took control. The few precious Wasp flame-throwers were used to burn the enemy out of some well-protected gun emplacements while the Camerons employed a section of their medium machine-guns to engage the main enemy force which was concealed in an orchard. The HLI used this support to rush the orchard and capture 60-70 prisoners. Rockingham needed to expand the bridgehead quickly because while the smokescreen curbed visibility, German gunners on nearby Walcheren Island and near the Dutch town of Breskens were beginning to find targets. The SD&G Highlanders were told to take Hoofdplaat and then advance west along the coast. The village was strongly defended. The Germans had taken advantage of the smokescreen to transfer men from Walcheren and had switched the divisional reserves to the new front. The Canadians also found the situation tense. The troopers of 7th Recce Regiment were dismounted and brought forward to take over the HLI positions so the battalion could mount a co-ordinated attack on Biervliet. Here, as elsewhere in the pocket, the fields or polders were protected by dikes and drained by a network of ditches. It was impossible to advance across most of the polders saturated by the October rains or deliberately flooded by the enemy. This left the narrow dikes as the only approach routes. The HLI used two parallel dikes to reach the village at dusk on Oct. 11. By then the enemy had withdrawn in the face of overwhelming artillery concentrations and had taken up new positions south of the village. The inevitable counterattack began that night and one HLI platoon was overrun, but the battalion was able to restore the situation. While fighting for Hoofdplaat, the SD&G Highlanders took heavy casualties, more than 70 in two days. The Glens used six-pounder anti-tank guns to overcome a large enemy pillbox, several 20-mm gun positions and fortified houses in the village. >On battlefield tours of the Breskens Pocket it is important to put yourself in the place of the incredibly courageous young men who fought these isolated platoon and section engagements. The polders are much the same as they were and it is possible to retrace the exact routes. However, imaginations falter as we remind ourselves of the rain and mud and continuous shelling that served as a backdrop for a battle that required skill, patience and courage. How do we understand Captain B.G. Fox and his gun crew who went to the assistance of his comrades taking a six-pounder anti-tank gun forward, sighting the gun while under fire, then putting rounds into the fortified stronghold that was holding up the Glens advance? 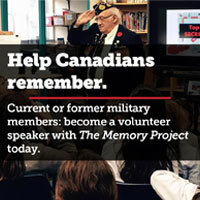 There are scores of such stories, some recorded, some lost to our collective memory. The close combat of the first two days ended in something approaching a stalemate. The German counterattacks had in the words of their situation report “failed completely”, but the price paid by 9th Bde. was sapping its ability to maintain the offensive. Lieutenant-General Guy Simonds and the divisional commander, Major-General Dan Spry, had originally intended to use their reserve brigade, the 8th, to exploit the Leopold Canal bridgehead. However, it was evident a new plan was needed. The chemical warfare team was told to maintain and extend their smokescreen while the diminished flotilla of Buffaloes was used to transport 8th Bde. into the northeast bridgehead. Once there, Brigadier K.G. Blackader’s men would attack due south and link up with 4th Div. to help open up a land bridge into the pocket via the Isabella Polder at the south end of the Braakman Inlet. This manoeuvre caught the enemy by surprise. The Queen’s Own Rifles took over Biervliet and launched a powerful thrust that cracked through the enemy. Joined by the North Shores and Le Régiment de la Chaudière, the QORs advanced rapidly linking up with 4th Div. on Oct. 15. The divisional engineers immediately went to work clearing minefields, exploding obstacles and improving road beds. The forces inside the pocket could now be guaranteed adequate supplies. Spry was now in a position to conduct a carefully controlled operation designed to crush the enemy with well supported simultaneous attacks. Shells, and when possible air power, would be used to save Canadian lives. After the German commander was captured he told interrogators, with the arrogance of a typical German general, that Spry had failed to exploit opportunities for rapid advances. After two successful surprise attacks, which had cost the division almost a thousand casualties, Spry was quite certain it was better to fight the battle with overwhelming force, taking whatever time was necessary. This attitude, which was shared by every Canadian unit, was not popular at Army Group Headquarters where Field Marshal Bernard Montgomery was under growing pressure to speed up the opening of the Port of Antwerp. Under pressure from Admiral Bertram Ramsay and the Supreme Allied Commander, General Dwight D. Eisenhower, Monty had reluctantly agreed to place 52 Lowland Div. under the command of Simonds. This elite Scottish formation, which trained initially as a mountain division for employment in Norway, had just completed re-training as an air transportable division to be used in exploiting the hoped-for victory at Arnhem in the Netherlands. Now the 52nd was to join the Canadians in a battle fought over ground that was below sea level. The commitment of the Scottish Div. would greatly improve the odds in the Breskens Pocket, but it would not be available until Oct. 18 and the Canadians were not allowed to wait. Stories of officers from Monty’s staff arriving at battalion, brigade and divisional headquarters to find out why it was taking so long to open up the port are part of the history of 3rd Cdn. Div. Montgomery himself met with Simonds, General Charles Foulkes and Spry to stress the need for speed, but the visits were to no avail. After 9th Bde. broke through German defences at Sasput and 8th Bde. captured Ijzendijke, the Germans withdrew to prepared positions in the western half of the pocket. Spry ordered a pause to allow 9th Bde. a brief period of rest to prepare a deliberate assault on the port of Breskens. Spry used 157 Lowland Bde. to take over the Leopold sector and follow up the German withdrawal to the Dutch village of Sluis. This allowed 3rd Div. to plan operations employing all three brigades in a coordinated offensive in the north. The first stage, 9th Bde.’s attack on Breskens, began in tragedy when a tanker carrying flame-throwing liquid exploded. The 30th Assault Bde. Royal Engineers of 79th Armoured Div. lost most of its vehicles, including Flail tanks used for mine clearing and bridging tanks needed to deal with ditches. The memorial erected at the site lists the names of seven Canadians and 31 of their British comrades. Oostburg was the exception. Increasingly, the enemy was surrendering rather than continuing the battle at close range. Their commander, had issued his own version of Hitler’s “kith and kin” order warning that “the names of deserters will be made known to the civilian population at home and their next of kin will be looked on as enemies of the German people….” However, the ordinary soldier as well as his officers had had enough and white flags appeared once their lives were in danger. More than 12,700 prisoners were taken in the Breskens Pocket, 90 per cent of the enemy troops engaged. In explaining their defeat, German prisoners, always reluctant to acknowledge the skill and courage of Allied infantry, inevitably mentioned overwhelming air power, Allied artillery and tanks. The contribution of the tactical air force and the gunners was certainly important, but there were no tanks involved in the battle. The Germans were referring to the M-10s of the 3rd Anti- Tank Regt. Royal Cdn. Artillery whose contributions to victory are seldom acknowledged. In the Scheldt, the three-inch high velocity gun mounted on a Sherman chassis was repeatedly used against concrete bunkers and other fortified positions. The M-10 was so lightly armoured that even the 20-mm anti-aircraft weapon the Germans used as super-heavy machine-guns in the Breskens Pocket could penetrate the armoured plate. On the raised roads of polder country the high profile M-10 was especially vulnerable, but its support was badly needed and the regiment rose to the occasion providing close support and giving enemy soldiers an excuse to explain their surrender. The last phase of the battle began when 7th Bde., reinforced from the rapidly shrinking pool of infantry replacements, began to sweep west along the coastline towards the Belgian border. The German gun positions, which were the raison d’être of the pocket, had to be taken one by one, but elsewhere the will to resist was not strong. Ninth Bde. crossed the Belgian border and entered Knocke-sur-Mer on Oct. 31, capturing General Eberding and his staff who were packed and prepared for captivity. As of 9:50 a.m. on Nov. 3, mopping up was complete and Operation Switchback was over. Third Div. was now ordered to get ready for a new operation code-named Relax. To carry it out they were to travel to Gent where the population was waiting to welcome the weary soldiers into their homes and hearts. More than 400 of their comrades were left behind in temporary, but well-marked graves. They lie today in the Canadian military cemetery at Adegem, Belgium, along with men from 4th Cdn. and Polish Armoured divisions.